It has been a lovely Saturday so far. I have been busy catching up with school work and cleaning up my room. I returned from my trip last weekend and walked in to a room that looked like a tornado ran over it. I ate treats for breakfast this morning. I love that I wake up and get excited for breakfast. 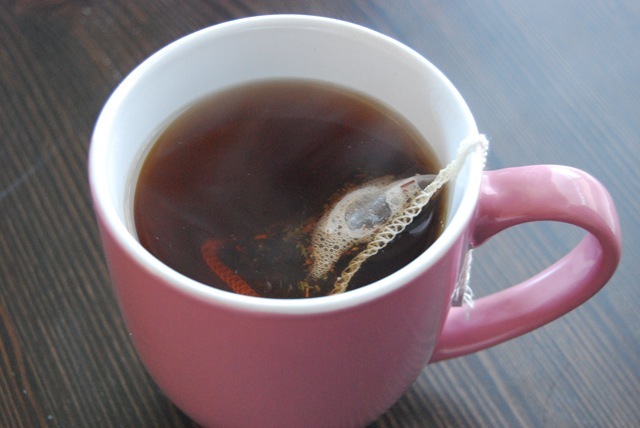 Chocolate Mint Truffle Tea to wake-up my body in the morning. 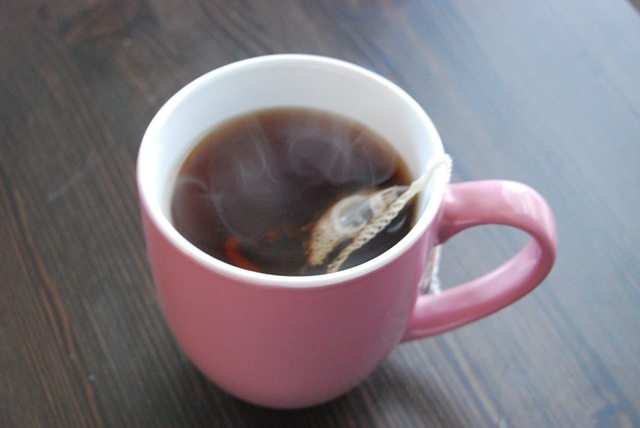 I added almond milk to the tea afterwards, I like my chocolate tea to have a creamy texture. I love this flavor combo, which was inspired from Kat. 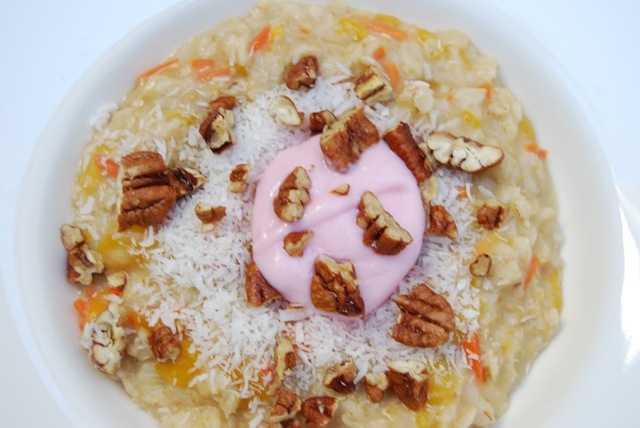 It’s like eating a combination of hot creamy oatmeal, vanilla cake, mix with tropical flavors from the mango and coconut + the chewiness of the shredded carrots. I love the light sweetness that comes from the mango and flavored icing (dollop of strawberry yogurt). Each bite packs a lot of flavors. With each spoonful, you grab a different mix of toppings. The carrots in this mix are soft and chewy and does not taste like vegetables at all to me. Put all the above ingredients in a sauce pan, turn heat to medium and stir occasionally. The mixture will come to a boil and most of the liquid will be absorbed. It took about 8 minutes for me because I used thick rolled oats. 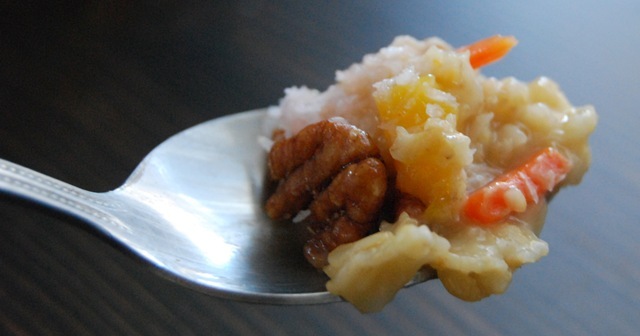 You can make a big batch of the oatmeal base so you can enjoy your carrot cake for several days in a row. I just multiplied the servings x 3. If you want some free delicious bread, go check out Julian Bakery bread giveaway here. It ends on Tuesday. Chocolate and carrot cake seems to be the best choice ever. 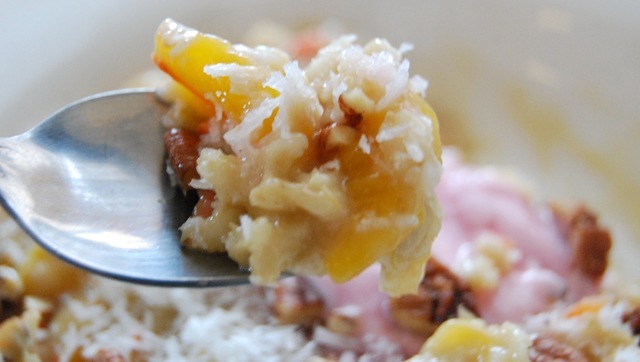 Those oats look like a great idea-you have gotten my addicted to coconut I swear. Hollie, I’m glad you are using coconut ingredients. Being addicted to coconut is not a bad thing right? It’s a source of healthy fats for me. 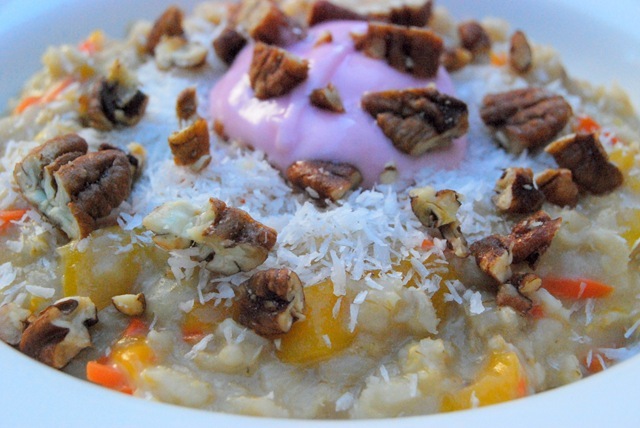 That is one gorgeous bowl of oatmeal! I bet the addition of mango makes it super tasty. Hope you are having a wonderful weekend!! Mango or pineapple is a great addition, it taste tropical to me. That oatmeal looks bomb! Seriously. Perfect combo! Never would have thought that carrots would be good on oatmeal. 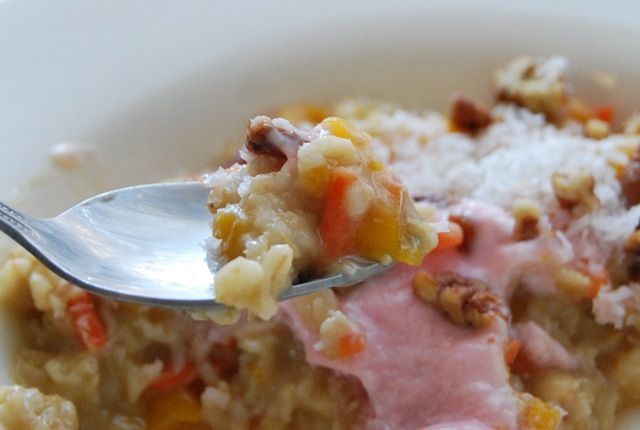 I promise that if you grate the carrots and add it to the oatmeal, it doesn’t taste like carrots at all. You’ll have the orange plump but not the carrot taste. Wow…usually I find “look at mah oatz!” posts kind of dull…but I really want to make this bowl! That looks awesome! Thanks Mimi. I show my oats from time to time because believe it or not, I have friends and family ask me how I make my oats and how I enjoy oats everyday. The secret is variety so that it doesn’t get boring. Mmmm that oatmeal looks like pure art!! Karin, as much as it looks great,I think it actually taste better than it looks. 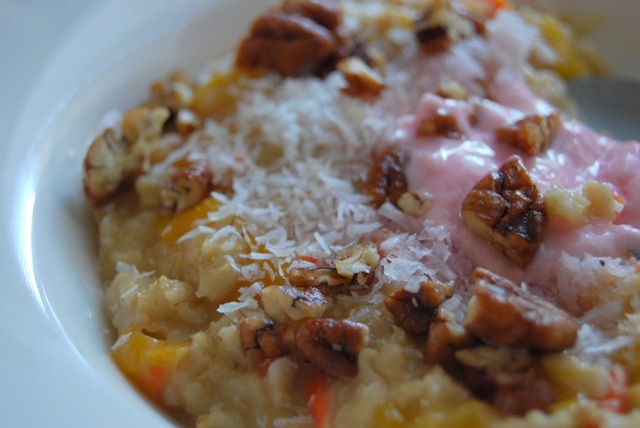 What a great combo and calling it Carrot Cake Oatmeal fits perfect. Sounds delicious I usually add almond milk and agave or vegan sugar that’s it I always forget to add other goodies to oatmeal. I do to my Chia Pudding why not oatmeal who knows, I just have to start doing this to have more variety. I agree, throwing the party was hard work but really fun. Still working on my post 🙂 It’s good that I have until the 28th because I’ve been busy with the household right now. I’m not a huge oatmeal fan, but I think I’d like that! Hmmm!! Oh. My.Gosh. This idea is GENIUS! You always have the most creative and delicious looking recipes.